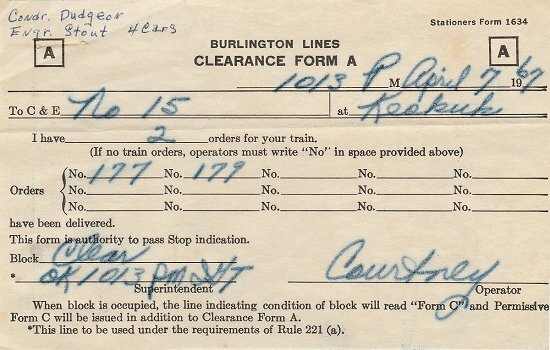 CB&Q agent-operator Kieth Courtney signed this clearance form for for the last run of train No. 15 through Keokuk on April 7, 1967. After its overnight run the train would terminate at Minneapolis the next day. Mr. Courtney kindly allowed us to scan this copy, which is still in his possession. He was also the last Superintendent of the Keokuk Union Depot while it was in regular railroad operation.